Gum disease at any stage, whether its Gingivitis or advanced periodontitis, is severe and needs to be addressed as soon as possible. 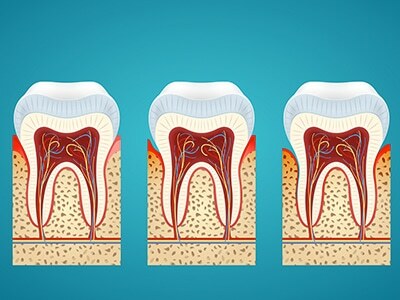 Gum disease can cause a multitude of problems, ranging from infections to tooth and bone loss. While gum disease is serious and difficult to treat in advanced stages, it can be prevented. As always, prevention is the best form of treatment, so read on to learn about the common causes of gum disease and how you can avoid them. Plaque is far and away the most common cause of gum disease. Plaque is a film of bacteria that forms on the teeth and gums. It can be removed by brushing and flossing at home, although if it hardens, it forms tartar which cannot be removed via a toothbrush or floss. The best way to avoid gum disease caused by plaque is to maintain a healthy dental regime at home, which means brushing in the morning and night and flossing daily. Using an ADA-approved mouthwash can also help. In addition to your home regime, you also need to visit the dentist at least every six months for a professional scale and clean. A hygienist will be able to remove the plaque and tartar that you can’t reach. Some medications, both over-the-counter and prescription, can increase the production of bacteria by reducing the amount of saliva you produce. Saliva is essential in controlling bacteria in our mouths, so if it is reduced, we end up with more bacteria. If you’re noticing a dry mouth due to medication, you should discuss this with your doctor to see if there is an alternative. If this isn’t possible, visit your dentist and they can suggest a mouthwash or treatment that increases saliva flow. Smoking or using tobacco causes enormous harm to our mouths. It disrupts the way it functions and creates a multitude of issues, from a breakdown of gum tissues to affecting immune systems. Or causing oral cancers. This makes the tissue in your mouth susceptible to infection and infection leads to gum disease. Luckily, treating this issue is simple. Quit smoking! Not only will you reduce your chances of gum disease, but your breath will also smell better, and you’ll avoid having nicotine-stained teeth later in life. Pregnancy and menstrual cycles can create changes in hormones. These hormonal changes can affect your gums and make them more susceptible to infections and disease. The best way to tell if your gums are suffering as a result of a hormonal change is to see if your gums look inflamed or feel puffy. If they do, just make sure you pay extra attention to your oral care regime. You may notice bleeding after brushing and flossing, but a little blood is better than allowing plaque and bacteria to settle on the teeth. Gum inflammation should subside after you have given birth, or your hormones have returned to normal levels. If you still notice any swelling, bleeding or pain, make sure you visit your dentist. It’s also a good idea to check in with your dentist at the beginning of your pregnancy, to make sure there are no underlying conditions. If your diet is high in sugary and acidic foods, and low in nutritionally-dense foods, your gum health will suffer. Your diet should be full of whole foods, like fruit, vegetables, calcium-sources and lean proteins. You also need to drink plenty of water and monitor your consumption of sweetened drinks and alcohol. If you watch what you put in your mouth, your gum health will improve markedly which means your chances of developing gum disease will drop. Crooked, misshapen or crowded teeth are difficult to keep clean. The overlaps mean there are areas that floss and toothbrushes cannot reach, so they become breeding grounds for gum disease-causing bacteria. You should visit a dentist to see if they can suggest a technique to reach these areas, but the best way to address these issues is to get some orthodontic or cosmetic treatments done. These procedures will not only make your teeth and gums easier to clean, but they’ll also improve the overall aesthetic of your smile. Follow these tips to reduce your chances of gum disease. The most important thing to do is maintain a good oral health regime, and visit your dentist on a regular basis. Early-stage gum disease is very easy to treat, but the longer it is allowed to progress, the worse it gets.